This is an electronic publication. 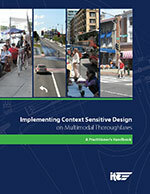 Implementing Context Sensitive Design on Multimodal Corridors: A Practitioner's Handbook This informational report builds on the recommended practices presented in the 2010 ITE publication, "Design Walkable Urban Thoroughfares: A Context Sensitive Approach", and includes an expanded focus on topic areas such as freight accommodations, speed management, and context sensitive design in lower density urban and built-up suburban environments. A number of real-world case studies are also included in the report, to demonstrate the medium- and long-term impacts of successful context sensitive design projects.